Scientists from Skoltech, the University of Graz and the Royal Observatory of Belgium have developed a method to forecast the strength of the 11-year solar activity cycle. The results of this study may shed light into the process by which magnetic fields are generated on the sun. This is key, as these magnetic fields affect health and the operability of various earthbound devices. Following the invention of the telescope, astronomers Galileo Galileo, Thomas Harriot, Christoph Scheiner and Jan Fabricius discovered spots on the sun's disk. 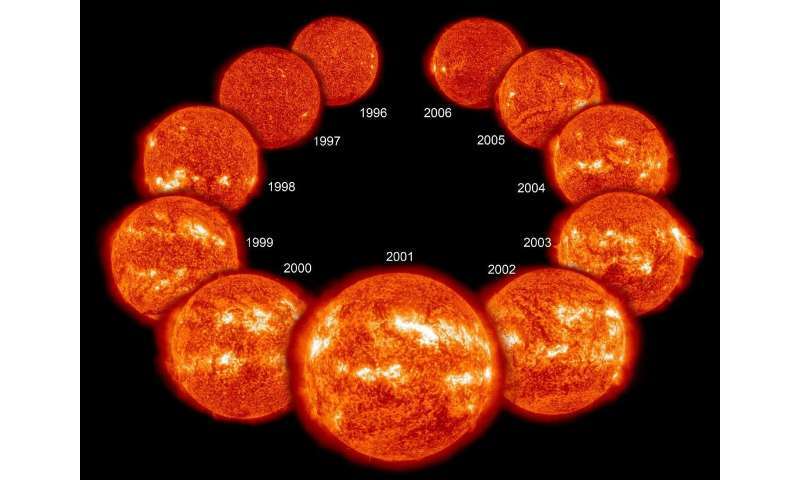 But it would be another 250 years before it was understood that the sun's behavior is subject to 11-year cycles. The 11-year periodicity of solar activity was accidentally discovered in the 19th century by German chemist Henry Schwabe. He was fond of astronomy, and with the help of an amateur telescope, sought to find a hypothetical small planet inside the orbit of Mercury. He never found the planet, but thanks to systematic observations he discovered the cycles of solar activity. At present, such sunspots observations are carried out twice a day throughout the year by observatories around the world and the prediction of the 11-year solar cycle is very important in many areas of human activity in space and on Earth. At the start of the 20th century, renowned Russian scientist Alexander Chizhevsky proposed the idea of space weather and laid the foundation for the emergence of a new branch of science exploring the relationship between the sun and the Earth. He theorized that solar wind constantly flows from the solar corona, the atmosphere of the sun. This wind is a stream of charged particles that blows toward the Earth and other planets of the solar system. The solar wind carries the energy of the sun, and stretches and carries the solar magnetic field into outer space. As a result, the entire solar system is affected by the solar wind and the solar magnetic field. And since the sun rotates, the magnetic field in the interplanetary space takes the form of wavy spiral folds, like a ballerina's skirt. The Earth and all the planets of the solar system exist within these folds. People regularly take solar activity forecasts into account. Switching satellites into safe mode during active events on the sun can prevent disruption of the operation of solar cells and key satellite systems. Space weather can pose a threat to astronauts in space, who face significant radiation exposure and the risk of radiation sickness. Active events on the sun can lead to interference in the propagation of radio signals. Space weather affects the radiation doses that airline pilots and passengers receive, especially with transpolar flights. The timely forecasting of space weather is of great importance for the aviation industry and the protection of a number of ground-based technical systems, as well as for manned space flights and the launching of scientific and commercial satellites. The solar cycle begins with the birth of sunspots on the sun's poles. As the cycle develops, more sunspots emerge, moving from the poles to the sun's equator. During lulls in solar activity, when sunspots on the sun are practically absent, the magnetic field of the sun looks like an ordinary magnet, with circular magnetic lines and two poles. Since the equator of the sun rotates faster than the poles, during the rotation of the sun, the magnetic field is tangled like thread. As we approach peak solar activity, the usual magnetic field with two poles turns into a lot of local magnetic fields on the surface of the sun, in the atmosphere of the sun, the entangled loops that contain solar matter. These can be thrown out as flares and coronal mass ejections and reach the Earth. Consequently, during peak solar activity, the number of active events on the sun increases substantially. On the other hand, at the peak of its activity, the solar magnetic field is so strong that it forces out galactic cosmic rays from the solar system. These pose a great danger to technological systems in space. Every 11 years, the poles of the sun switch; the southern pole takes the place of the northern one, and vice versa. This is a complex process that has not been fully understood. The solar dynamo model is one of the most complex nonlinear problems in mathematical physics. Each solar cycle is assigned a number; for example, we are now approaching of the nadir of the 24th cycle of solar activity. The scientific goal is to predict the strength of the 25th cycle as early as possible. Scientists from Skoltech, the University of Graz and the Royal Observatory of Belgium have developed a method that makes it possible to forecast the strength of the next 11-year cycle far in advance of what was previously thought possible – namely, during the peak of the current solar cycle. In other words, once the current solar cycle peaks and the poles of the sun swap places, researchers will know how strong the next 11-year cycle will be. These discoveries contribute to the study of the solar dynamo. The analysis revealed that short-term variability of solar activity in the declining phase of a cycle is related to the strength of the following cycle. Sudden variations of activity in the declining phase are associated with a slowdown of the decline of the sunspots, which can be evidence of activity that manifests itself as a larger amplitude in the next cycle. In the current study, a new and robust method is introduced to quantify the short-term variations of sunspot activity around the peak of a current cycle, producing a relevant indicator with predictive power for the strength of the ensuing cycle. According to the forecast, the future solar activity will be low and the strength of the next 25th cycle of solar activity will be even lower than the current cycle. The results of the study are published in the The Astrophysical Journal. "Space weather is the science of the future. It's what unites us all, makes our lives better, allows us to take care of our planet. This is the next step in the exploration of outer space. And whatever storms are raging, we wish you good weather in space," said Skoltech Professor Tatyana Podladchikova, the study's lead author.